Why Is There an Oily Film at the Top of My Aquarium? Plant debris can cause an organic waste film in a fish tank. When an oily film forms on top of the water, it indicates the tank is dirty or the elements that keep the water healthy are out of balance. Removing the slick is only a temporary solution; identify the cause and restore balance to prevent it from reoccuring. Fish excrement, dying plants and leftover pieces of food and any other type of organic decay that aren't removed through cleaning and filtration contaminate aquarium water. When the surface of the water isn't moving enough to keep contaminants circulating throughout the tank, they will float to the top and group together, forming sometimes an oily film on the surface. You can remove some of the film by dragging a paper towel across the top of the water or by capturing the oil slick during a water change by scooping it up into a pitcher or container. To prevent it from forming again, either increase the agitation of the surface water or install a skimmer. The decay process is one way that food can cause an oil slick, but oil contained in the food can also cause an oil slick. The oil is released upon contact with the water. 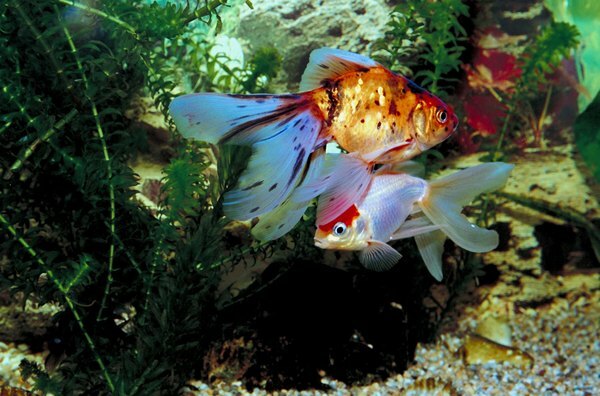 Fresh foods as well as some flake foods contain oils that contaminate the aquarium. Remove the oil in the same way as an organic waste film, with a paper towel or during a water change. A permanent solution is to change the type of food and increase surface agitation. Occasionally, oil released during cooking in the kitchen can settle on the surface of water in the aquarium, even if the tank is located in a neighboring room. In this case, it may be necessary to move the tank farther away from the kitchen or run an exhaust fan when cooking. An algae bloom is more likely to cause a bright green color throughout the entire tank than an oil slick, but it can cause a colored film on the water's surface that may appear oily. An algae bloom is caused by a combination of too much light and poor water quality. Remove a surface slick caused by algae by scooping out as much of the algae as possible. This is only a small part of the solution. Clean the tank and filtration system, lower the lighting and monitor water quality closely. Reducing the level of nitrates in the water will help. Like an algae bloom, a bacteria bloom is a sudden overabundance of bacteria in the tank. It can include both harmful and beneficial bacteria, but during a bloom even bacteria that are normally good for your fish can become dangerous. Under normal conditions, a protein skimmer will prevent bacteria from forming a film on the water's surface and bring the bloom under control. But during a severe bloom, a skimmer will be rendered ineffective. Use an oxidation agent to allow the skimmer to control the bacteria. How Often Should I Clean Out My Freshwater Aquarium Tank? What Does It Mean When Your Goldfish Swim to the Top of the Bowl? What Causes Scum in an Aquarium?